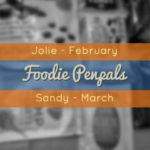 This is my first time participating in Foodie Penpals! 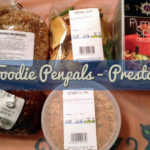 I heard about it from Not Exactly Bento and was immediately intrigued and signed up. A little bit later I was paired with 2 people – one to send me goodies and one to send to. I was assigned to Jenn from Odds and Ends with JJ — head over there to see what she got from me. Sara from Run Around Sara sent me my box. My paint-splatter-decorated box arrived in the mail and I tore in to it. I enjoyed reading the note from Sara and her reasons for choosing each item to send me. Before sending me a box, she asked me a lot of good questions like: Any dietary concerns/restrictions or food preferences I should be aware of? Do you prefer sweet/spicy/salty or “I like it all!”? Coffee, tea, or hot chocolate? If you could eat one cuisine every day for the next year, what would it be? Do you do more baking or more cooking? Are you an adventurous eater? Favorite candy and/or type of chocolate? Something you’d like to try from Boston? The tupperware is the perfect size for snacks without being too big so that it takes up a lot of space in my apartment. The edamame crackers have already been opened and are halfway gone. I’ve only tried one (my boyfriend is a cracker-hound!) but it tasted surprisingly very much like edamame! I could see it going well with tons of different types of dips and cheeses, though they’ve been devoured so far naked. 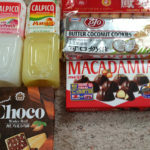 Everything else I’ve had before FPP except the Mexican Drinking Chocolate, Stone Ground Chocolate, and the 100-Calorie pack Cookies. I’ve never seen the Oatmeal Chocolate Chip Cookies at my Trader Joe’s and am munching on them now as I type this. I can’t really taste the chocolate chips in the cookies and they’re a bit salty, but you get a good deal of the cookies and they taste much better than other 100-calorie packs. I’m saving the Stone Ground Chocolate and Mexican Drinking Chocolate for a rainy day. Trader Joe’s has such a great chocolate section that it can be overwhelming. Our Trader Joe’s has the chocolate where you wait to check-out so there is never time to look at all the options. Thanks for a great box Sara! 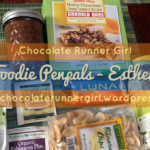 Check out Sara’s Blog and Jennifer’s Blog. 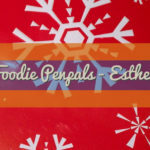 I took my sister with me to shop for Jennifer’s box and she loved the idea so much that she’s signed up for next month’s! 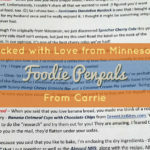 The great thing about Foodie Penpals is that you don’t have to have a blog to participate.